As expected, Samsung finally launched the Galaxy Note 8 at the Galaxy Unpacked event 2017, held in New York on Wednesday, August 23. We had been getting a lot of leaks and rumors about the Galaxy Note 8 price, features, and availability since the last couple of months and now it’s finally here and let’s see what it has to offer. If you remember, the Galaxy Note 7 was a big hit for Samsung after it was launched back in the same month of August 11. But unfortunately, soon after its launch, the batteries of the Note 7 starts exploding around the world, including nearly 100 cases in the U.S. alone, then Samsung and the U.S. Consumer Product Safety Commission (CPSC) announced a complete official recall of all Galaxy Note 7s in the U.S. and later for other countries as well. But now, when the next Galaxy Note is here let’s not talk about its previous generations. Now let’s talk about the newly launched Galaxy Note 8. The Galaxy Note 8 features the biggest ever 6.3-inch QuadHD+ AMOLED Infinity Display with a resolution of 2960×1440 to make it even better and more easy to use the S Pen on your Galaxy Note 8 Screen. The display comes with default Full HD resolution which can be changed to Quad HD+ (WQHD+) from the display Settings. With its curved side edges, it makes you hold your Galaxy device even more comfortably. The Samsung Galaxy Note 8 is powered by a 1.6GHz octa-core Qualcomm Snapdragon 835 processor with 6GB of RAM. The phone comes with 64GB of internal storage that can be expanded up to 256GB via a microSD card. As far as the cameras are concerned, the Samsung Galaxy Note 8 sport a dual-setup “telephoto” 12-megapixel camera, with OIS (Optical Image Stabilisation) in both cameras and a quick launch feature which will help you launch the camera fast. Samsung has claimed that the “Note 8’s camera is twice as good as before.” It sports 8-megapixel front shooter for selfies. The Samsung Galaxy Note 8 runs on Android 7.1 out of the box and packs a 3300mAh non-removable battery. The Galaxy Note 8 comes with a fingerprint sensor, iris scanner, and facial recognition. IP68 dust and water resistance., and support for wireless charging. The Galaxy Note 8 also supports NFC and MST for Samsung Pay, and offers USB Type-C charging port. 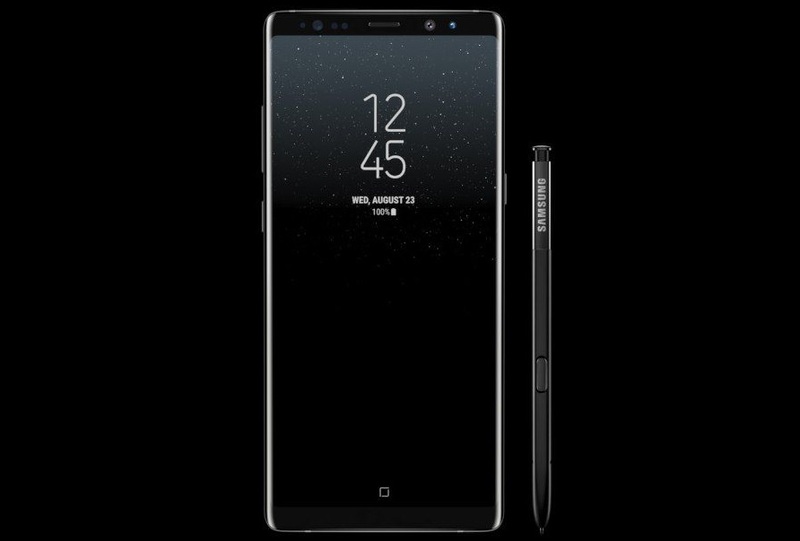 Last but not the least the Galaxy Note 8 comes with signature S Pen, which according to the company will enable people to be communicate in “more personal ways” than ever with the Always On-display powered Galaxy Note 8. As one of the few smartphones the Galaxy Note 8 offer Bluetooth 5.0 and LTE Cat 16 connectivity features. 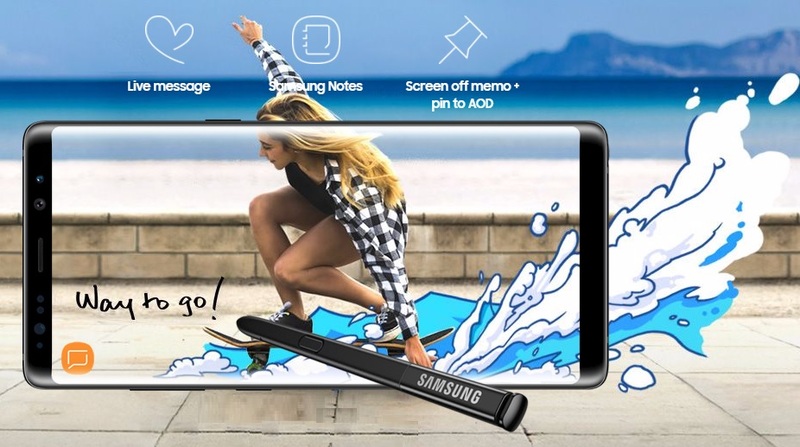 With newly introduced ‘Live Messages‘ users will be able to handwrite a message, add special effects and share it as an animated GIF on several popular messaging and social apps. 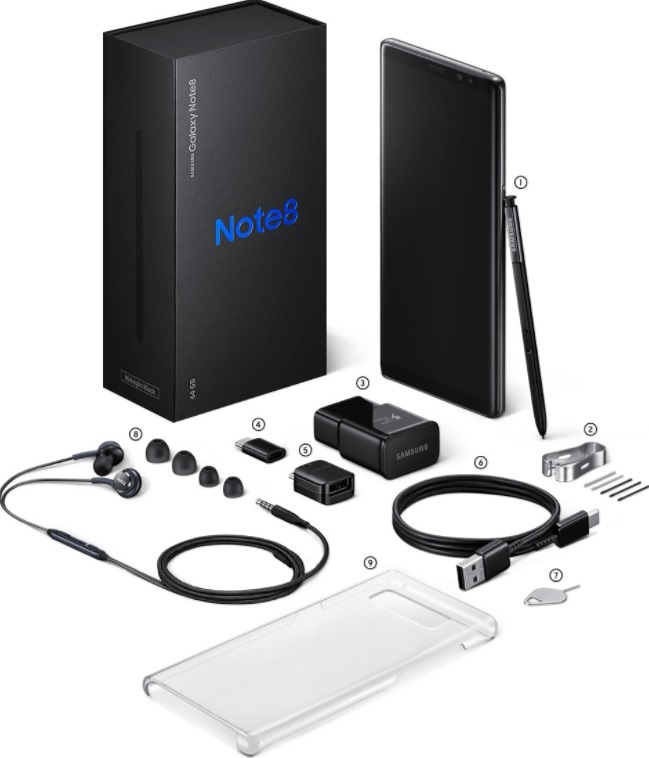 These are following items buyers will get with the Galaxy Note 8. Pre-orders for the Samsung Galaxy Note 8 will begin “in a few days” in the US and will finally hit stores beginning on September 15. The device will be available in Midnight Black, Maple Gold, Orchid Grey, and Deep Sea Blue colours options. In the US, the Samsung Galaxy Note 8 is priced between $930 (roughly Rs. 59,500) on AT&T and $960 on (roughly Rs. 61,500) on Verizon for the base variant. Samsung said that, people pre-ordering the Galaxy Note 8 will also be able to avail a Gear 360 camera or a charging bundle for free, and it will also be offering Galaxy Note 7 customers discounts in a bid to encourage them to purchase the Note 8. There is no details on when the company will bring the Galaxy Note 8 in India just yet, but it is expected to be available exclusively via Amazon in India website.